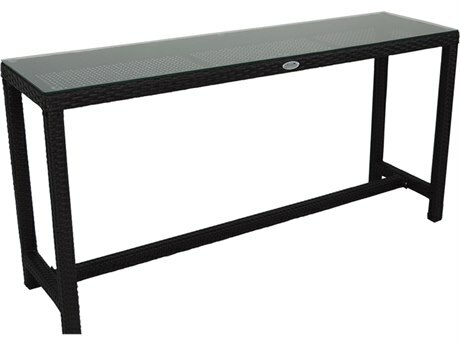 Patio console tables provide a versatile table solution that functions well in numerous hard-to-furnish areas of your outdoor space. 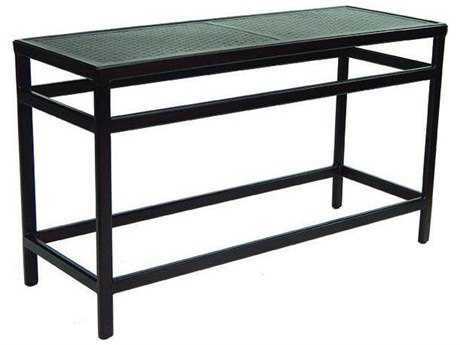 These types of tables are typically rectangular in shape and feature at least one flat side, suited for arranging adjacent to any wall, sofa, or other flat surface. 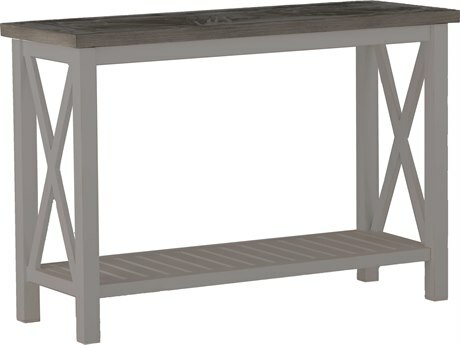 PatioLiving carries a diverse inventory of outdoor console tables with many size, material, and finish options to choose from, making it easy to find the perfect table for your outdoor space and personal style preferences. 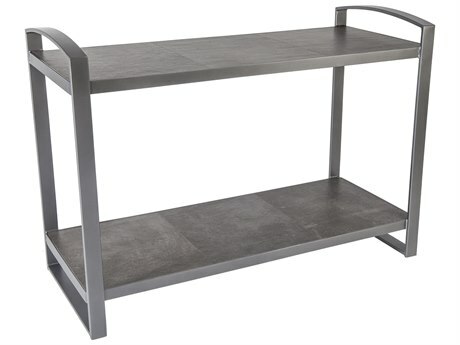 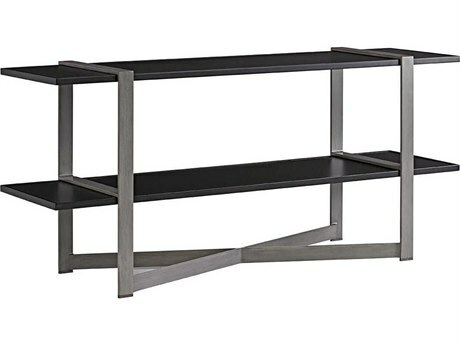 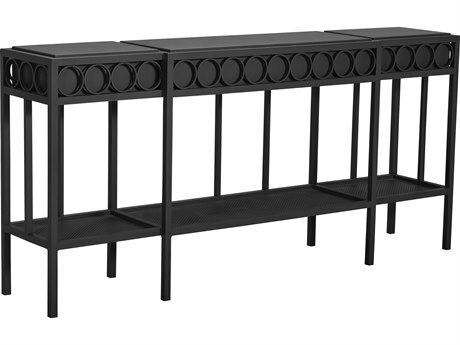 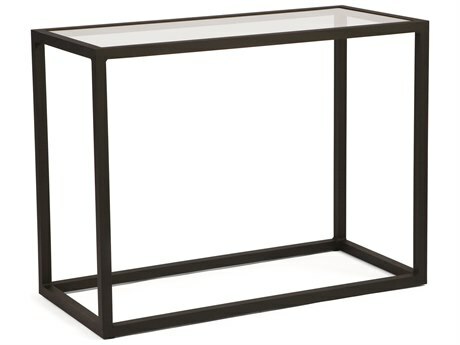 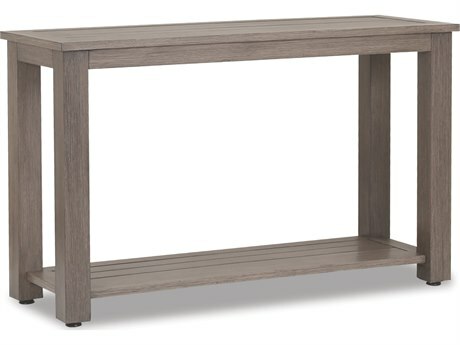 Generally rectangular, a patio console table is appropriate for narrow spaces where square coffee tables might not fit, and also behind sofas. 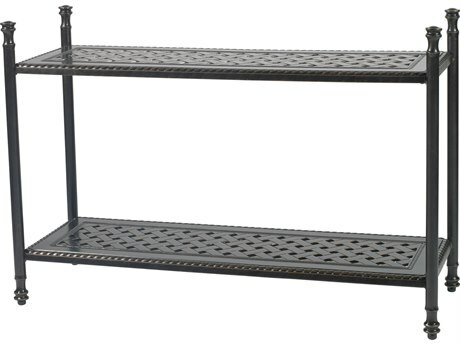 They are ideal for storing and displaying a variety of objects and items. 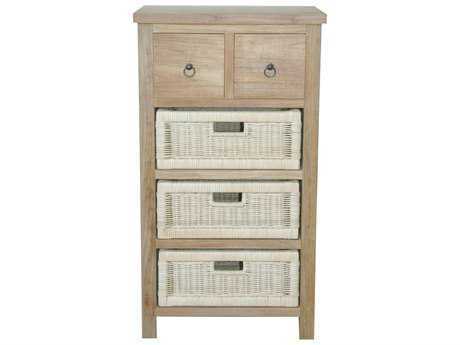 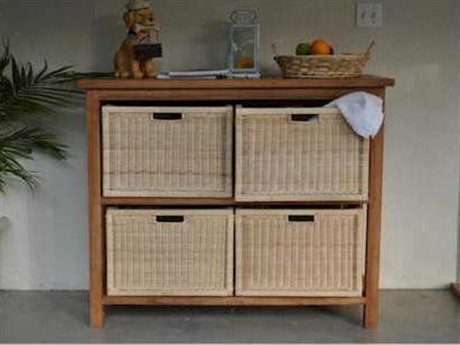 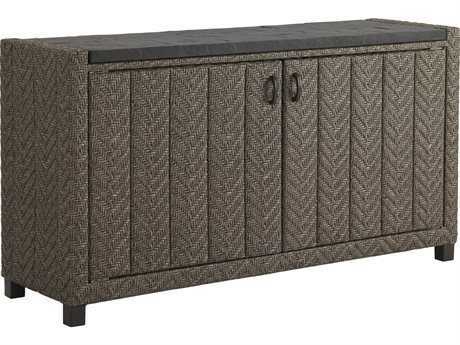 Select models feature multiple shelves, closed cabinets, drawers, rattan baskets, and basket-style raised sides. 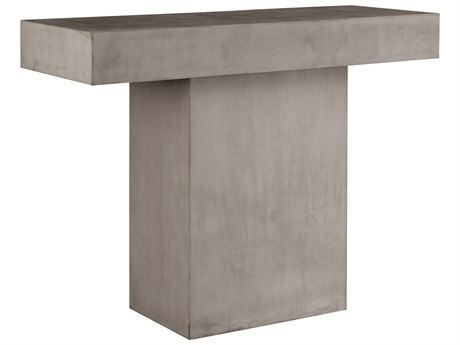 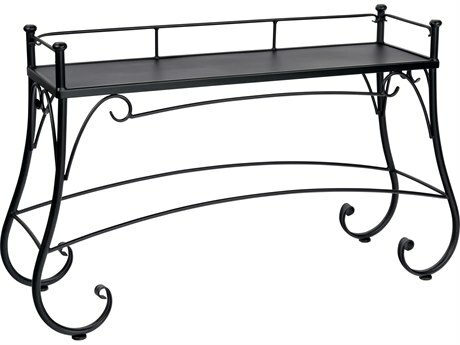 An outdoor console table is typically crafted from highly-durable metals, such as wrought iron or cast aluminum. 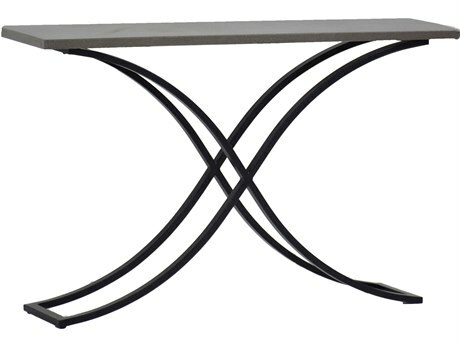 Cast aluminum tables are relatively light and feature intricate stylistic details. 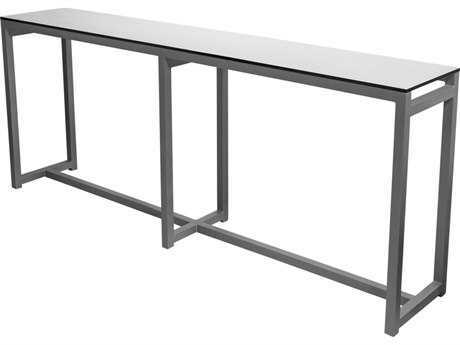 They are also available in a wide range of finishes, making a cast aluminum outdoor console table a highly decorative and portable option. 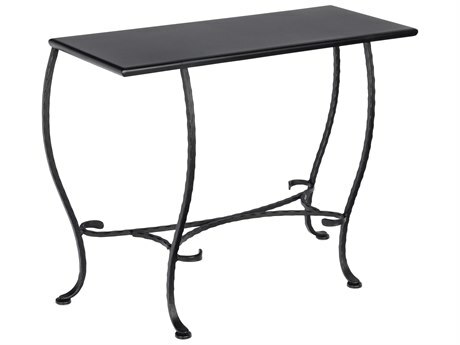 Wrought iron tables are generally more traditional and feature moderate curves and heavier builds. 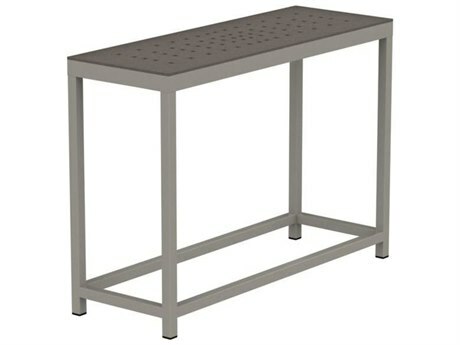 All metal tables are treated with a long-lasting powder coating engineered to prevent rust even in rainy climates or high humidity over years of use. 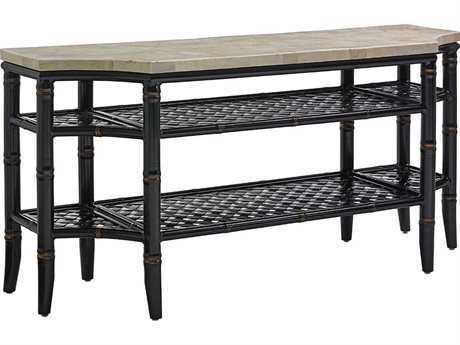 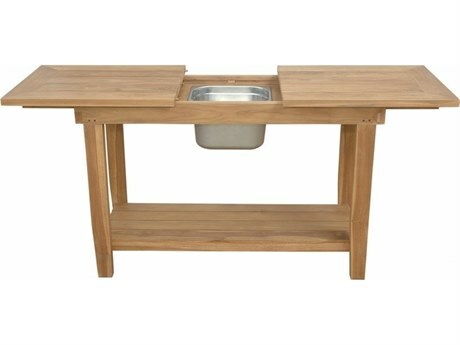 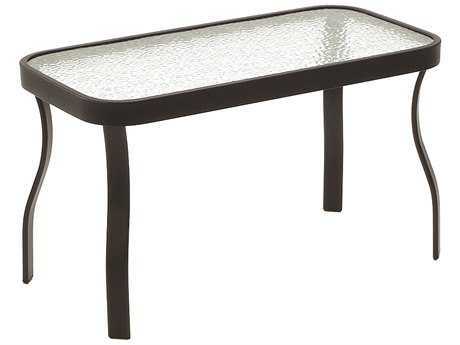 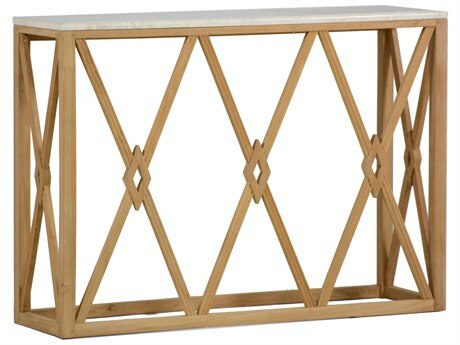 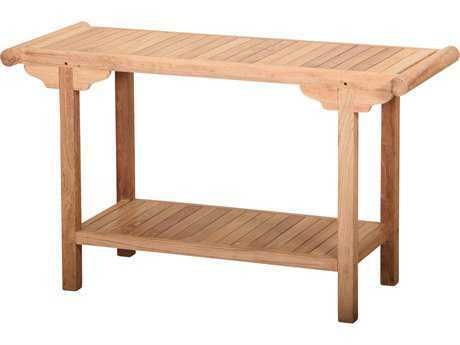 Additional patio console table varieties include wood, wicker, and recycled plastic. 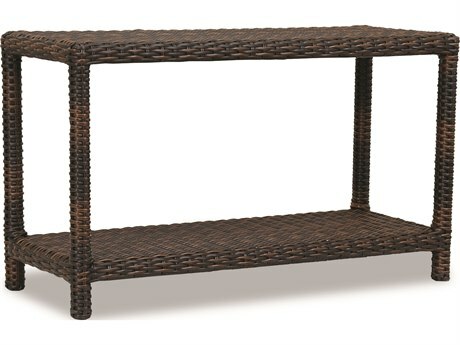 Wicker options carry the distinct woven wicker look and contribute an element of refined sophistication to any setting. 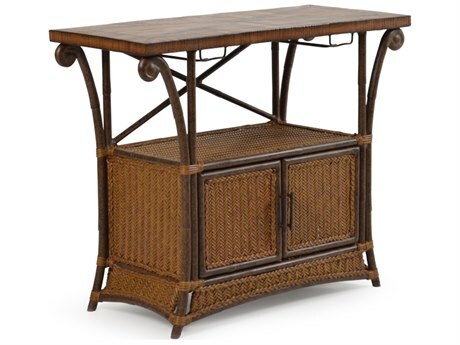 Most wicker tables are reinforced with aluminum framing for added stability, and synthetic wicker weaves are break, split, and burn resistant. 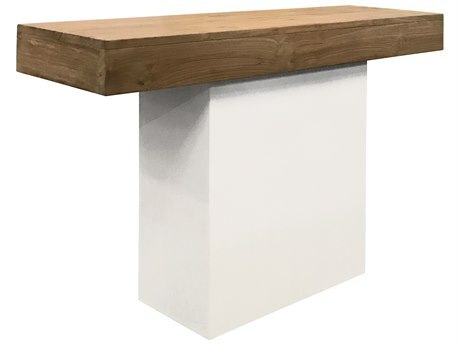 Wood tables contribute to an organic, natural aesthetic, while recycled plastic models bring a vibrant, casual element to any space. 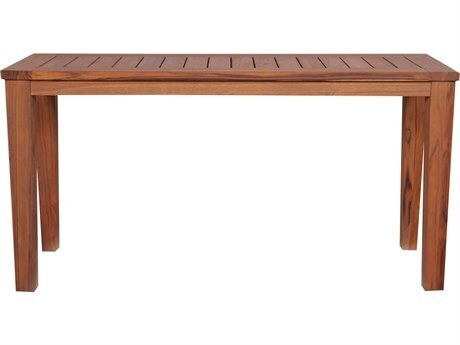 Wood and recycled plastic tables are weatherized for resilience to use in outdoor environments. 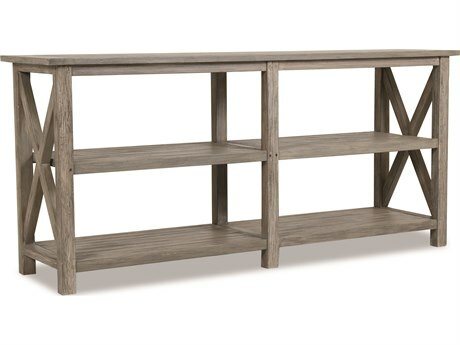 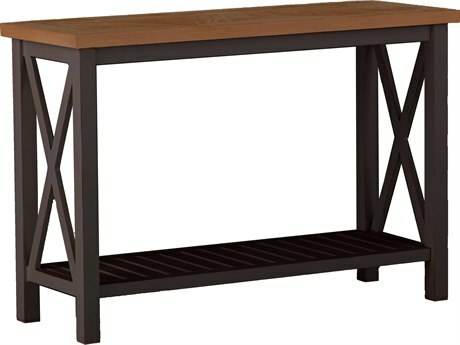 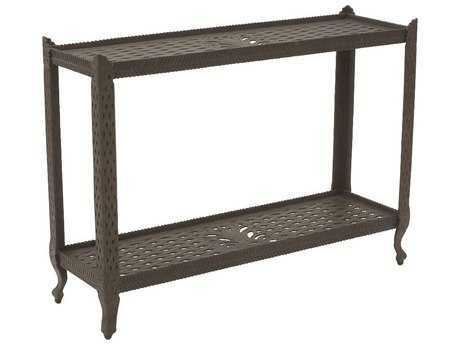 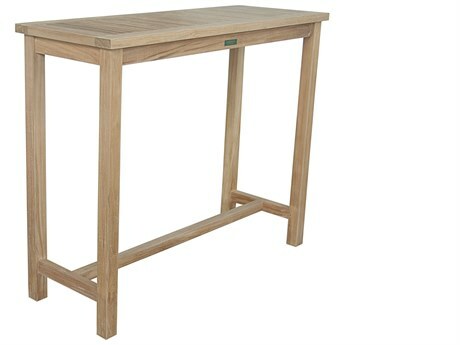 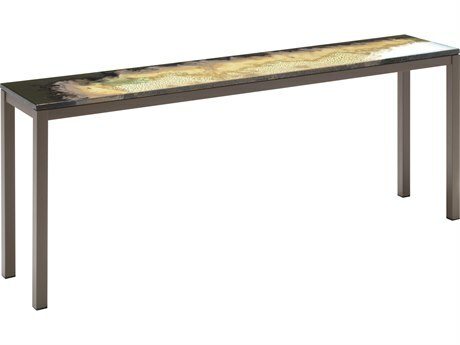 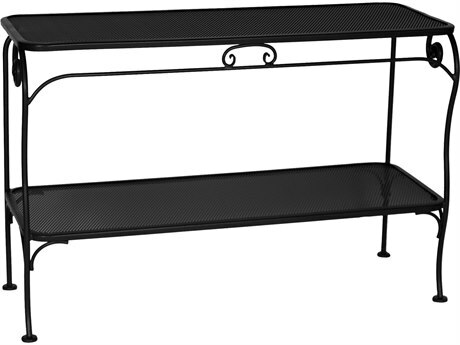 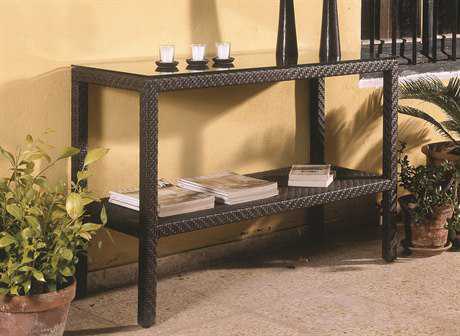 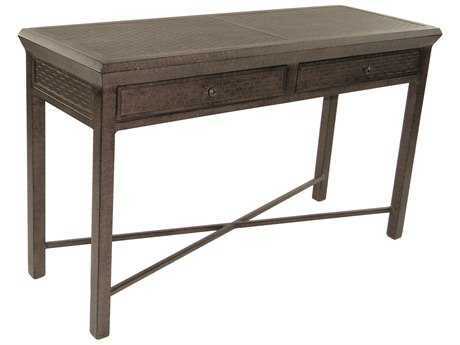 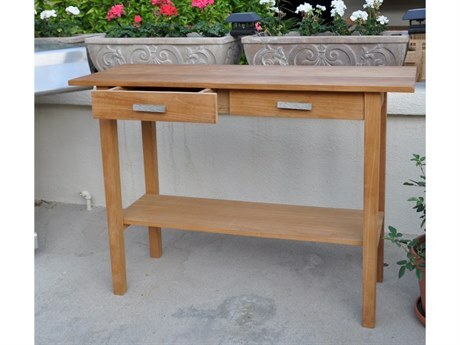 A typical patio console table generally measures 29" to 60" or longer in length. 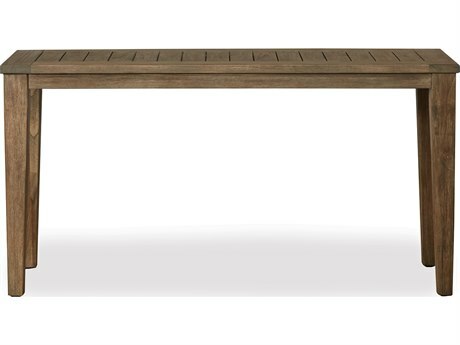 The wide range of table size options available makes it easy to find a stylish table that pairs proportionally with any sofa, loveseat, or outdoor space. 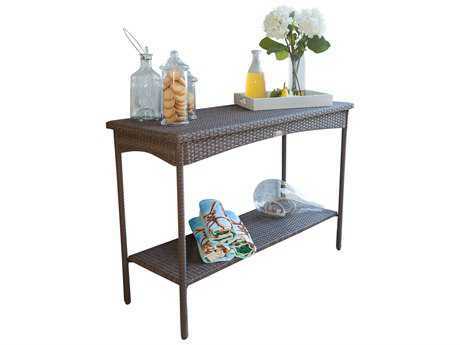 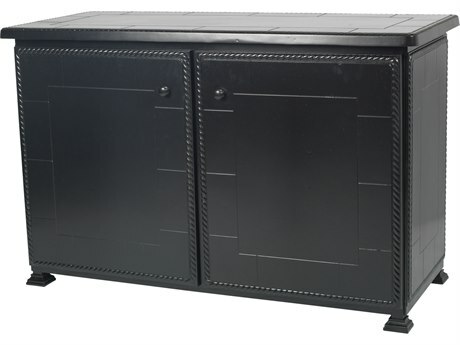 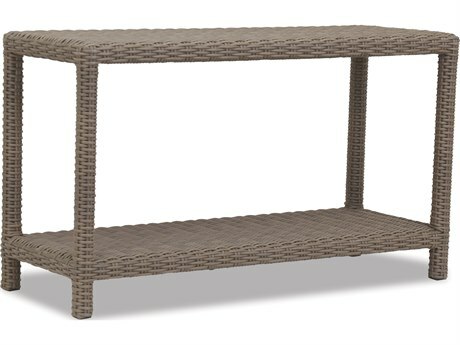 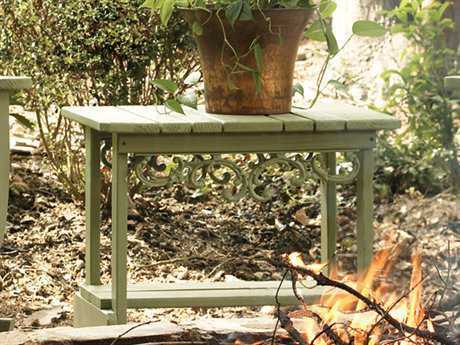 Patio console tables are ideal for displaying and storing a wide variety of outdoor items and decorative accents. 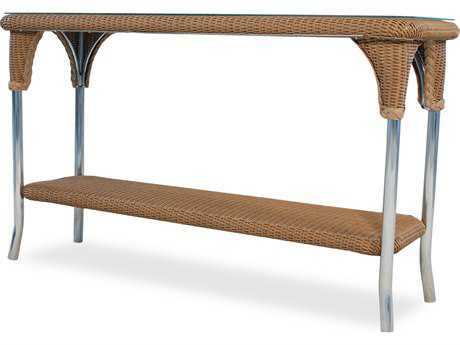 Outdoor console styles range from ornate, with intricate detailing and curves, to boxy in design, for a contemporary sleek aesthetic. 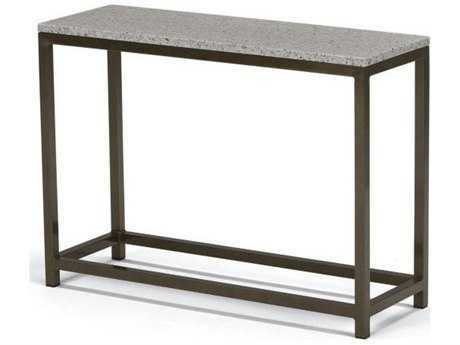 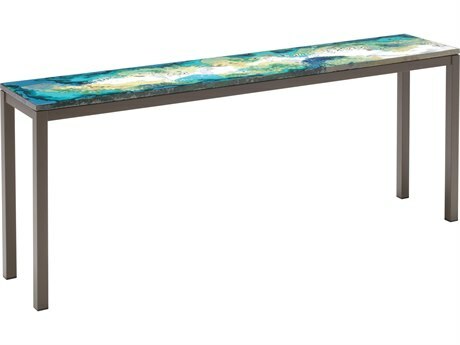 Select tables feature highly decorative tops, such as mosaic stone tops. 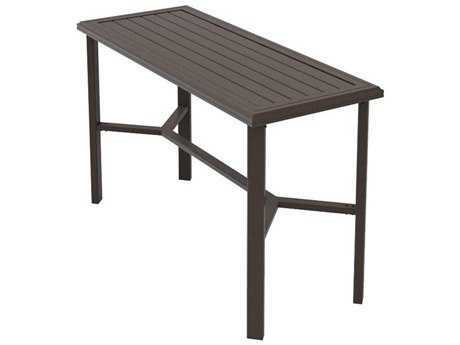 For more information on the materials used to make PatioLiving furniture, you can read our Patio Tables Buying Guide.